New Liturgical Movement: No More Christian Bar Mitzvah! A friend recently alerted me to a diocesan newsletter sent out by His Excellency Peter Libasci, Bishop of Manchester, New Hampshire, in which he explains how he is initiating a three-year plan to reintroduce the historical order of the Rites of Initiation, Baptism, Confirmation and Communion. While this isn’t the only step necessary to a revival of the Faith, it is a hugely important one, in my opinion, one that helps to create the foundation for long term and beneficial impact on the formation of the faithful in his diocese. It is consistent with the way that the Catechism describes them. These three sacraments form a natural unity and each makes sense in relation to the other two which is consistent with the goal of Christian life, eternal salvation; in the traditional order, this becomes clearer and more understandable. 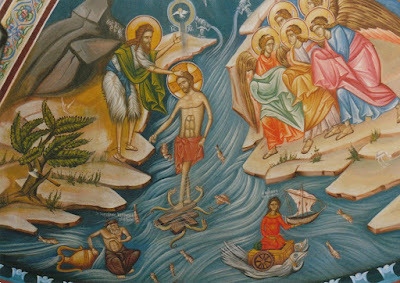 In simple terms, and as best as I can understand it, Baptism is the dying of the old self, united to Christ on the cross; Confirmation is the descent of the Holy Spirit on the person as experienced by the Apostles at Pentecost; and the Eucharist imparts the resurrection of the new person united to the resurrection of Christ and the partaking of the divine nature. Regarding the improvement of ongoing formation that might result from this, Bishop Libasci gives the example of the potential for the revitalization of youth ministry. 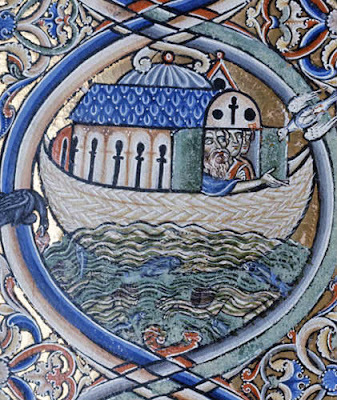 One other occurs to me; to my knowledge there is no commonly accepted articulation of the basis of a schema for the art in churches of the Roman Rite. It seems to me that the visible communication of the truths of this triple sacrament should be a guiding principle for the art that is permanently in our churches. The very architecture of the church should be ordered to reveal these mysteries week on week, day on day, whenever anyone goes into the church building. Even if this were present in a church, if the order in which the sacraments are given to people is wrong, then the message conveyed by the visible aspects of the interior is at odds with what is actually happening. Confusion results. Furthermore, in the ideal, it seems to me that the whole congregation should be engaged with the celebration of each of the rites of initiation, so that the idea that someone is coming into their community within the Body of Christ may be clearer to all. The fundamental truths of the Faith are imparted for everyone present through the harmony of art, architecture and liturgical action - not just the select few present on a quiet Saturday morning. The Old and New testaments types that point to the Sacrament can be portrayed in pictorial arrangements that enable the congregation to engage with them at the appropriate time. For example, in a baptistery, there may be images of the crossing of the Red Sea by the Israelites, the crossing of the Jordan led by Joshua, scenes of the Flood and Noah’s ark, as well as the Baptism of Christ; there are many other possibilities, of course. This is how a participation in the liturgy might more powerfully evangelize and catechize, both prior to the rites of intitiation, and as a mystagogical catechesis to all on an ongoing basis. My education in this comes through the books The Bible and the Liturgy and Baptismal Imagery in Early Christianity, in addition to the Catechism, (and now Bishop Libasci). I became aware of these books and this theme through Fr Sebastian Carnazzo's scripture and liturgy classes in Pontifex University's Masters in Sacred Arts. Age of body does not determine age of soul. Even in childhood, man can attain spiritual maturity: as the book of Wisdom says: “For old age is not honored for length of time, or measured by number of years.” Many children, through the strength of the Holy Spirit they have received, have bravely fought for Christ even to the shedding of their blood. Paradoxically, the ability to understand what they have been through and its importance in their lives at any subsequent point will be enhanced by this in those who receive it early and in the right order, as will the desire to do so. 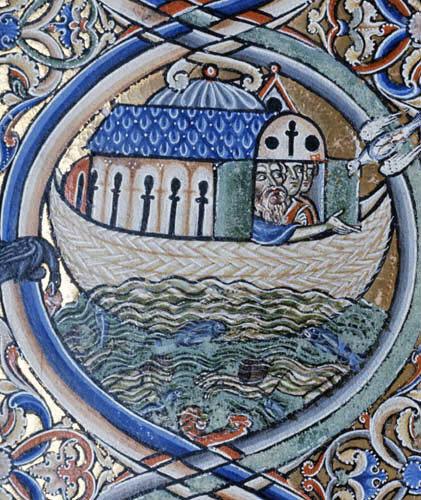 Below is an image of Noah’s ark from the 12th-century Winchester Psalter.